Clarisonic offers the best in Sonic skin cleansing, with devices designed for the face, body and feet. The Mia facial skin-care systems treat conditions such as dull skin, acne, enlarged pores and wrinkles. American-made and professionally recommended, Clarisonic proudly partners with Dr. Pfieger and other skincare physicians, luxury retailers and premium spas to transform the skin care experience. Originally developed for skincare professionals to use in treatment, Clarisonic quickly became the No. 1 cleansing brush recommended by leading dermatologists, aestheticians and spa professionals* – transforming the skincare industry, one pore at a time. Soon after releasing its first device, Clarisonic introduced the next generation of sonic technology with the Opal® Sonic Infuser, to infuse powerful skincare ingredients into the eye contour, maximizing absorption by driving product deeper into the skin for younger looking eyes, faster. The Clarisonic Sonic Method, a combination of patented sonic devices and state-of-the-art skincare formulas, is clinically proven to amplify results of both professional treatments and daily skincare regimens. Its sonic technology harnesses a patented range of sonic frequency to drive oscillation between 200 to 350 movements per second, working with skin's natural elasticity to beautifully transform skin's texture and appearance. Unlike spinning devices, Clarisonic's patented sonic cleansing technology works with skin's natural elasticity, oscillating at a sonic frequency that produces over 300 movements per second. The resulting flexing action created between the outer and inner brushes works to loosen dirt and oil, removing deep-seated impurities from pores and priming skin to better absorb topical treatments. *Instrumental test based on makeup removal. 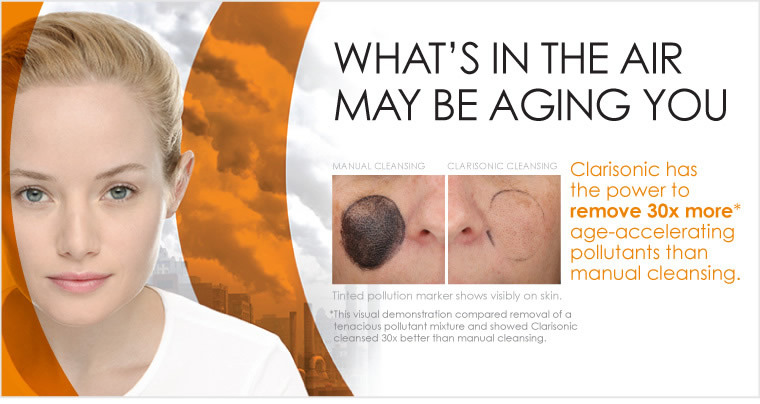 5 rotations of Clarisonic vs. 5 rotations of manual removal.